Available Now! – from the authors of Ringo Starr And The Beatles Beat, an in depth exploration of Ringo’s contribution to the Beatles self-titled 1968 masterpiece. 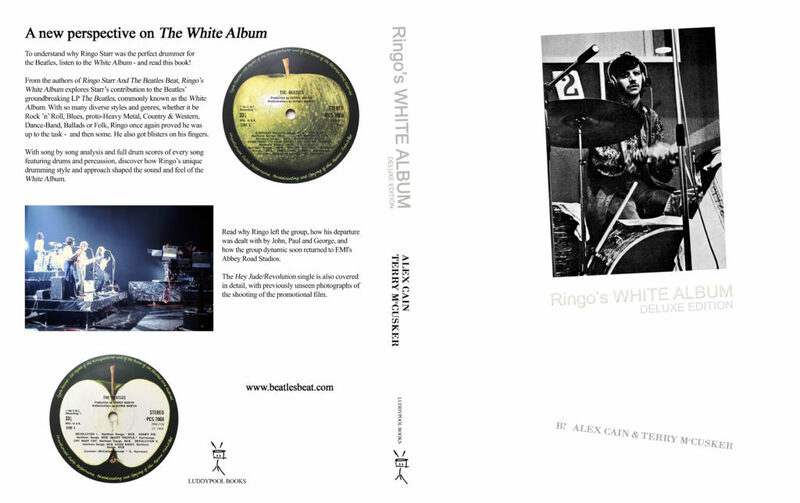 From the authors of Ringo Starr And The Beatles Beat, Ringo’s White Album explores Ringo’s contribution to the Beatles’ groundbreaking double L.P. THE BEATLES, commonly known as the White Album. With so many diverse styles and genres, whether it be Rock ’n’ Roll, Blues, prototype Heavy Metal, Country & Western, Dance-Band, Ballads or Folk, Ringo once again proved he was up to the task – and then some. He also got blisters on his fingers. 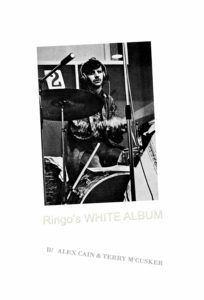 With song by song analysis, discover how Ringo’s unique drumming style and approach shaped the sound and feel of the White Album. Read how Ringo’s departure from the group was dealt with by John, Paul and George, and how the group dynamic soon returned to EMI’s Abbey Road Studios. The Hey Jude/Revolution single is also covered in detail, with previously unseen photographs of the shooting of the promotional films. Not included in the standard edition, the Deluxe Edition contains full drum scores of every White Album song (plus Hey Jude/Revolution) that features drums and percussion. Available in 2 configurations – Standard & Deluxe. – Detailed exploration of the Beatles unique and unrivalled use of percussion on the White Album. – The reasons behind Ringo’s exit from the group. – The merits of Paul McCartney’s drumming contributions to Back In The U.S.S.R. & Dear Prudence. – The Hey Jude/Revolution single and promo shoot (with rare, unpublished photos and eye-witness account). Deluxe version as above, expanded to include full drum scores of every White Album song featuring drums and percussion, plus the Hey Jude/Revolution single.